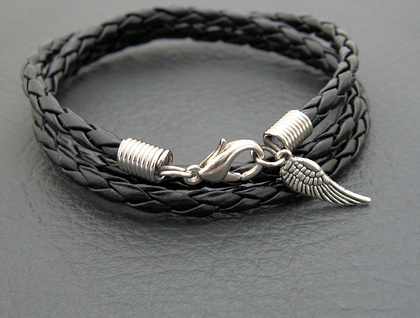 This wrap-around bracelet consists of a single length of black, braided leatheroid (imitation leather) which fastens with a simple, silver coloured lobster-claw clasp. 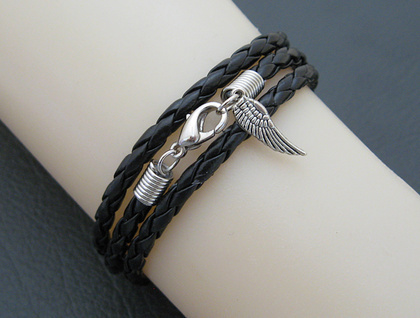 The bracelet finishes with a tiny angel-wing charm in antiqued silvertone. It does not feel like a bracelet: it doesn’t slide around on your wrist, it doesn’t jingle or chatter, and it doesn’t clatter or clack when it knocks against things. It is easy to wear because it bends with your movements, and flattens itself comfortably under your wrist when you are typing, rather than pressing lumpily against your wrist and scraping against the desk. Because it can be made to sit further up on the wrist, like a cuff bracelet, it stays tidily out of the way. 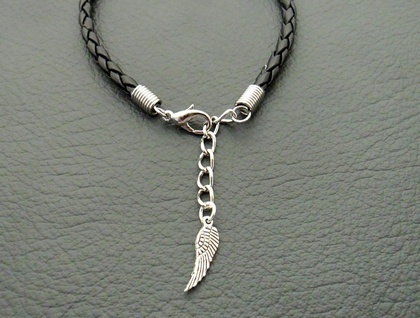 Alternatively, it can be worn loose and low on the wrist. A gold-plated version of this bracelet is also available here in my Felt shop. 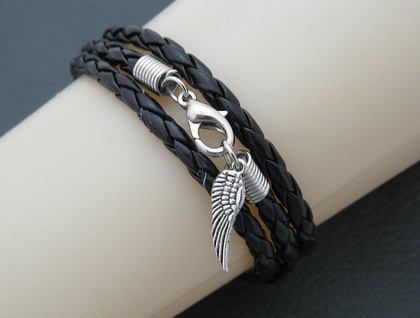 The standard length for these bracelets is 50cm, which wraps three times around a 16.5cm wrist.